The Electric Mobility Rascal P200 Electric Wheelchair. The Electric Mobility Rascal P200 is an electric wheelchair with good features, advanced adjustability, and a very small price tag. The backrest angle and tension can be adjusted and the multi-positional seat is particularly comfortable. The coli-suspension seat cushion can be removed and the controls will swing away so the chair can be moved up underneath a table easily. The armrests detach for side transfer. 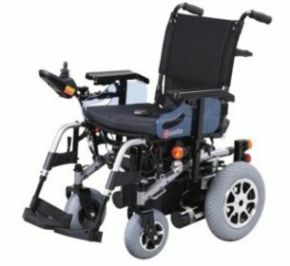 The Rascal P200 wheelchair is designed for everyday use and has a good range of up to 16 miles on a full battery charge. It has tie-down points for transport in accessible cars and has been crash tested.